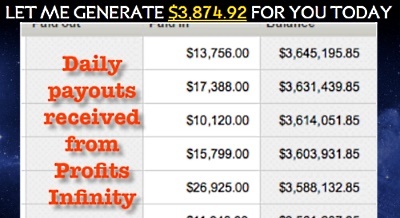 “Let me generate $3,874.92 for you today,” claims Mark Bromovich, the alleged co-founder of the Profits Infinity. This is not his only promise to you, though. As you will see in the Profits Infinity review below, he promises quite a few lucrative things to you. Everything is 100% safe, no credit card required, etc. etc. The question here is – Does he tell the truth? Or… Is he lying? 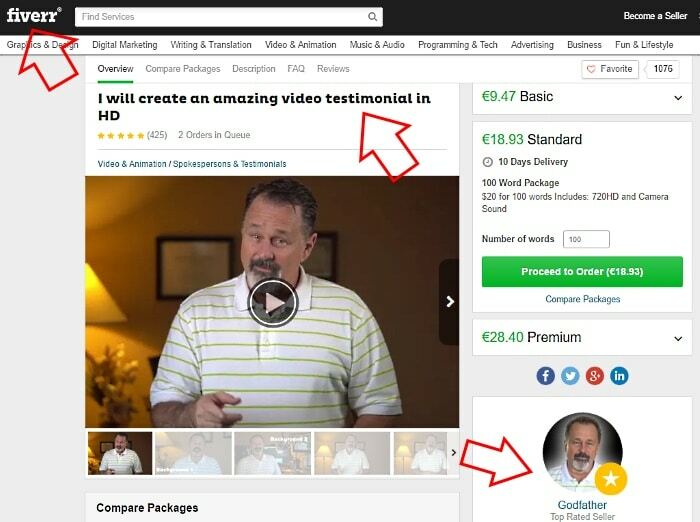 Is Profits Infinity a scam or legit? And… Is he a real person in the first place? And then, if its real, how much you must pay to start trading with the Profits Infinity? To answer these and other similar questions I did extensive research and wrote the review below. Read it through and see whether it is for you. Me verdict: SCAM!!! Designed to rip you off. Stay away! 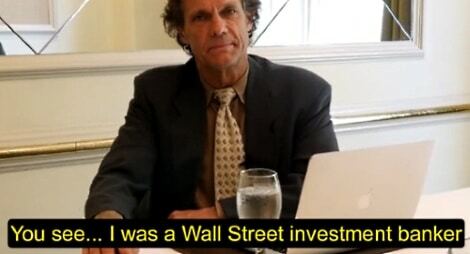 Before 2008 market crash, Mark Bromovich was allegedly one of those Wall Street sharks. He made millions of dollars by working for the Blackstone investment fund and trading all areas of the markets. However the market crash in 2008 sent companies and individuals into bankruptcy. Mark too discovered that he was dead broke. In his desperate attempt to survive, he became a truck driver. And the truck driver he was the next three years working 50 hours a week. …Right, the only missing piece was a trading expert. As you might guess, Mark Bromovich joined their expert team and together they finished their unique trading software. They called it Profits Infinity. The unique advantage of the Profits Infinity trading app over its competition was that it never loses a single trade. When the probability of winning drops below 96.8%, Profits Infinity app exits the trade. Yes, in that particular case you did not win. But you did not lose either. And that’s why investors’ money is 100% safe. Even though such a breakthrough software is not available for the ordinary people, Mark Bromovich is willing to give it to you for free. But only for limited time and to a limited number of people. Why? So that you could achieve your financial success as well. The only string here is that if you want to grab your seat you need to act at once. That’s the story behind the Profits Infinity trading app. Do NOT hurry to sign up, though. There are some very important things you must know. Therefore, please read my review to the end and you will see whether this app is for you or not. All these promises look like dream come true, don’t they? They only question is – Is it real? Or is it bogus? 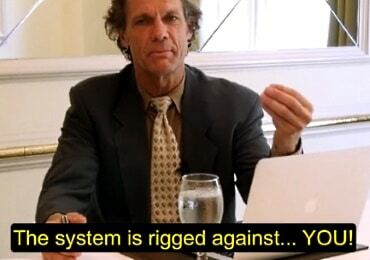 Can you trust Mark Bromovich and his Profits Infinity system? Obviously, there are more but these seven are more than enough to make a point. 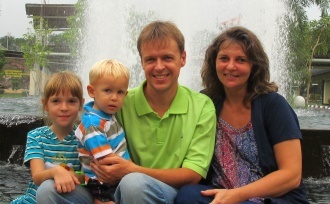 Similar to other such scams, you can find no traces of Mark Bromovich from the internet. There are none. With all his colorful career as ‘the Blackstone trading expert,’ there are no images of him, no articles, no quotes, no TV or radio shows, no interviews, nothing. 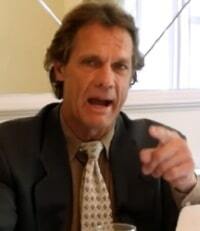 Listen, Mark Bromovich is a fictional character, played by an actor – just as all the other fake testimonials on the Profits Infinity site are given by paid actors. Let’s take Ruth Myers. Why is she fake? Because her face image is shamelessly stolen from the internet. The original photo belongs to Florence Colgate – the girl with the most beautiful face in the UK. This way I could prove every single testimonial in this page as bogus. 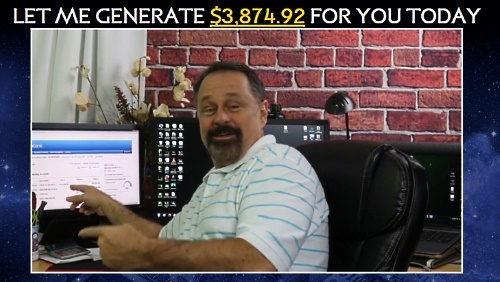 It’s funny how all such Binary Options trading scams promote their software for free. They do every trick they can to assure you that no credit card is required. It makes an impression to you as though you can start trading without any involvement of your own cash. While trading Binary Options requires the trading software, it also requires a trading account. Not only that. You also must fund your account with minimum $250 (in most cases). So therefore – the claim that no credit card required is plain wrong. Yes, you need to use your credit card AND your hard earned cash to fund your trading account. Even worse, if the broker happens to be some shady unregulated offshore company (which it probably is) then you are going to trust your sensitive credit card data in the hands of nasty scammers. This is a outright lie, designed to pitch you into a hurried signup process. The truth is, there are no people waiting in lines ready to take your seat. The scammers launched the Profits Infinity in March 14, 2016. Yes, right! Since then they have been promoting it the same old way – there are only few vacant spots available and if you want to grab this once-in-a-lifetime opportunity, you must act at once. You will have only one shot and if you hesitate, you’ve lost your chance for good. Wrong! If you visit their site tomorrow (or next week/month) and your vacant spot will still be waiting you. Another plain lie to sugarcoat the deal and make you feel as though you are somehow stumbled upon some exclusive opportunity. Don’t buy it though. Because, first, the Wealthy Elite have no interest in any shady Binary Options software. Second, there gazillion crappy Binary Options software on the market. All of them are touting pretty much the same – their software is by far the best trading bot in the world. Only they have discovered a secret formula – a holy grail of trading – which they are exploiting now. The Millionaire Blueprint, Tauribot, Citidel Investment App, The Safeguard Trader, the Profit Maker, Altronix, Trianasoft, the Push Money app, etc., etc. All of them claim that their app is for the wealthy elite only… But for limited time they are going to give ordinary people a free access to it. This claim is such a foolish lie that it can deceive only those who don’t bother to use their brain for thinking. Because if think about it, you would understand that there’s no such software in the world. And never will be. If there were such software, its owners would be way richer than George Soros. He is one of the most successful investors in the world with net worth $25,2 billion (in 2017). And guess what? Mr Soros too loses some trades. Has lost in the past and will lose in the future. Now let me ask you – how many people are richer than Georg Soros? And how many of them have got their wealth by running some Binary Options trading robot on autopilot? Is it Bill Gates, the founder of Microsoft? Or is it Mark Zuckerberg, the founder of Facebook? Michael Bloomberg? 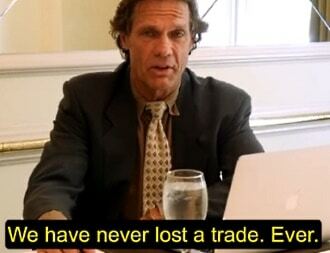 You see how ridiculous their ‘never lost a trade’ and ‘our clients never lose’ claims are. Again, screenshots like the one above are meant to sweeten your signup process. However, if you bother to do math, you understand that their claims don’t hold water. Because, as you can see from the image, they are targeting people with relatively small amount of money available for investing. If their trading software turns my $300 into $3,874 then what if I invest, say $30,000? Then Profits unlimited grows it into $387,400 in 24 hours. Next step, what if I invest that $387,400 tomorrow. It would generate me $5,001,334 by day after tomorrow. There is one thing that he says right, though. Obviously, he is trying to convince you that all make-money-online products are nasty scams while ONLY THEY are the holy ones. As far as I can see, the Profits Infinity is an outright scam. They can’t hide behind anything anymore. So therefore, this is my personal recommendation to you: Walk straight out of the gate don’t look back. Instead, stick with something that is legit and will not rip you off. My verdict: SCAM!!! Stay away! 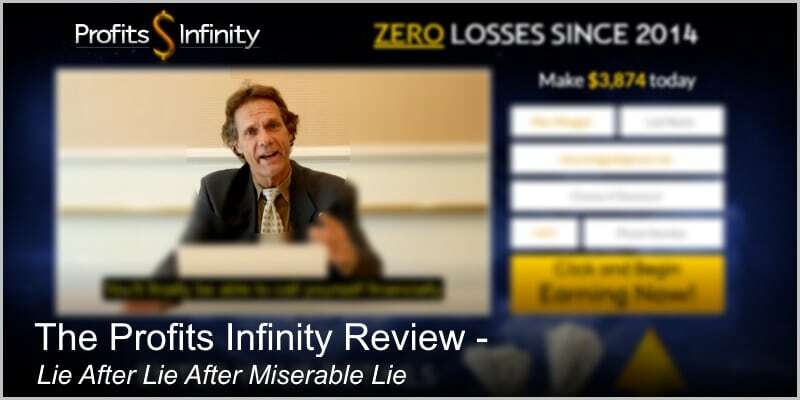 Now that you have read the Profits Infinity review what do you think of the product? Is it scam or legit? Do you have any experience with Profits Infinity (good or bad) that you want to share? Hello Egon, thanks for this review, very well thought out and well put together. You are extraordinary at your research, to not only be able to decipher this scam but to even find out who these people really are, and know that they are attempting to put false identities on themselves. It leaves me speechless that scams like this aren’t banned yet, you would think that people would report that they would be getting scammed, then the perpetrator would get some sort of punishment or something, but we all live in the wild west of the internet after all. This is a little off topic but the founder Mark Bromovich reminds me of some villain from a 1990’s action flick for some reason. Hi Jacob. Thanks for the feedback and kind words. It is encouraging. Truth be told, it is heartbreaking to read how innocent and unaware people get hooked and victimized by shameless rip-off schemes (like here – read those complaints on the comment section). It is even more heartbraking when children get hurt. So therefore, what I can do to combat those vile scams is write reviews like this one here – to warn and protect people from falling into those traps. Thank you again for the comment, sir. I appreciate it a lot. Thank you kindly for creating and sharing this rather informative and detailed warning about an absolutely shameless scam! It is appreciated. Thanks. Kudos and karma for saving many from losing their hard earned cash!. There are so many scams out there I am beginning to wonder if there is actually any legitimate ways to earn and honest dollar online! Hi Derek and thank you for the feedback. I am glad you took time to share your thoughts. As you might suspect, I often have the same feeling – like almost every opportunity you stumble across is some kind of wicked scheme. Fortunately, there are many different ways (legit and safe ways) to make from side money to full time income online. My personal recommendation is this. Take a look!